Insider Monkey has processed numerous 13F filings of hedge funds and famous investors to create an extensive database of hedge fund holdings. The 13F filings show the hedge funds and investors’ positions as of the end of the third quarter. You can find write-ups about an individual hedge fund’s trades on numerous financial news websites. However, in this article we will take a look at their collective moves and analyze what the smart money thinks of The Coca-Cola Company (NYSE:KO) based on that data. Renowned $213 billion beverage giant The Coca-Cola Company (NYSE:KO) was owned by just 39 of the hedge funds tracked by our database as of June 30. Rival PepsiCo, Inc. (NYSE:PEP) didn’t fare much better, with only 10% higher hedge fund ownership and both suffered sharp declines in ownership during Q2. 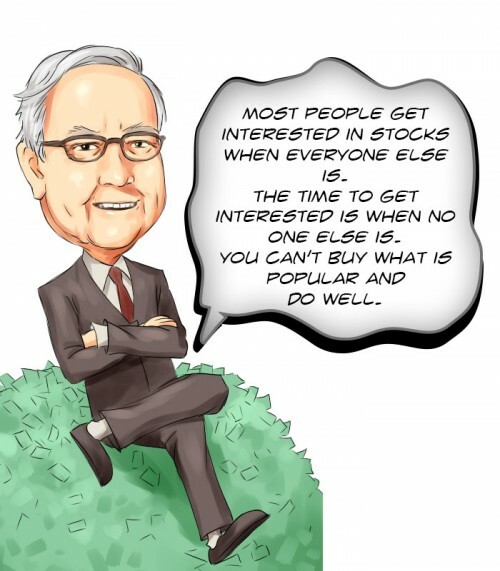 Of course, that would make them prime candidates to buy according to legendary billionaire investor Warren Buffett (who loves Coca-Cola stock), who recommends going against the crowd when timing your moves. One of 11 Companies With A Competitive Advantage For Long-Term Investors, Coca-Cola also has one of the longest dividend streaks going, topping our list of the 25 Best Dividend Stocks for Retirement. How have hedgies been trading The Coca-Cola Company (NYSE:KO)? Heading into the fourth quarter of 2018, a total of 39 of the hedge funds tracked by Insider Monkey were bullish on this stock, a 13% drop from the first quarter of 2018. 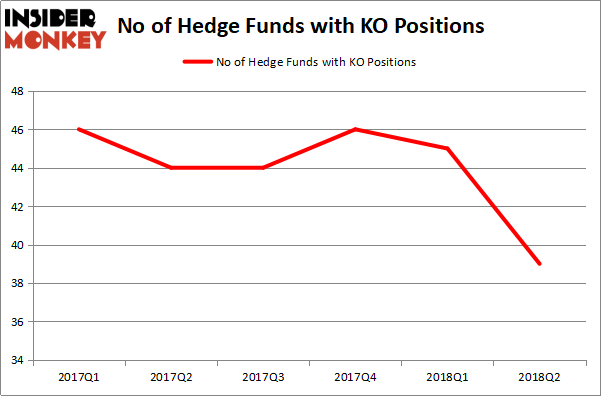 The graph below displays the number of hedge funds with bullish positions in KO over the last 6 quarters. With the smart money’s sentiment swirling, there exists a select group of notable hedge fund managers who were boosting their holdings considerably (or already accumulated large positions). Among these funds, Warren Buffett’s Berkshire Hathaway held the most valuable stake in The Coca-Cola Company (NYSE:KO), which was worth $17.54 billion at the end of the second quarter. On the second spot was Yacktman Asset Management which amassed $622.5 million worth of shares. Moreover, Skybridge Capital, Sirios Capital Management, and Locust Wood Capital Advisers were also bullish on The Coca-Cola Company (NYSE:KO), allocating a large percentage of their portfolios to this stock. Due to the fact that The Coca-Cola Company (NYSE:KO) has experienced a decline in interest from hedge fund managers, we can see that there is a sect of fund managers who were dropping their entire stakes by the end of the second quarter. Interestingly, Jim Simons’ Renaissance Technologies said goodbye to the biggest investment of the 700 funds followed by Insider Monkey, valued at about $128.3 million in stock, and Peter Rathjens, Bruce Clarke and John Campbell’s Arrowstreet Capital was right behind this move, as the fund dumped about $92 million worth. These moves are interesting, as total hedge fund interest was cut by 6 funds by the end of the second quarter. Let’s also examine hedge fund activity in other stocks – not necessarily in the same industry as The Coca-Cola Company (NYSE:KO) but similarly valued. We will take a look at China Mobile Ltd. (ADR) (NYSE:CHL), Novartis AG (ADR) (NYSE:NVS), Oracle Corporation (NASDAQ:ORCL), and Citigroup Inc. (NYSE:C). This group of stocks’ market values resemble KO’s market value. As you can see these stocks had an average of 45 hedge funds with bullish positions and the average amount invested in these stocks was $4.26 billion. That figure was $19.23 million in KO’s case. Citigroup Inc. (NYSE:C) is the most popular stock in this table. On the other hand China Mobile Ltd. (ADR) (NYSE:CHL) is the least popular one with only 13 bullish hedge fund positions. The Coca-Cola Company (NYSE:KO) is not the least popular stock in this group but hedge fund interest is still below average. This is a slightly negative signal, though Coca-Cola should be a consideration for any dividend investor’s portfolio.